The Yahoo Groups XJlist once again had their Spring Fling meeting in Harlan, KY. I found it interesting that there was never any real discussion this time about where to go, Harlan was the instant unanimous choice. Black Mountain in Harlan offers great camping, miles of trails and generally a perfect setting for a gathering of friends. But this time, Harlan offered one other enticement – Lion’s Den! 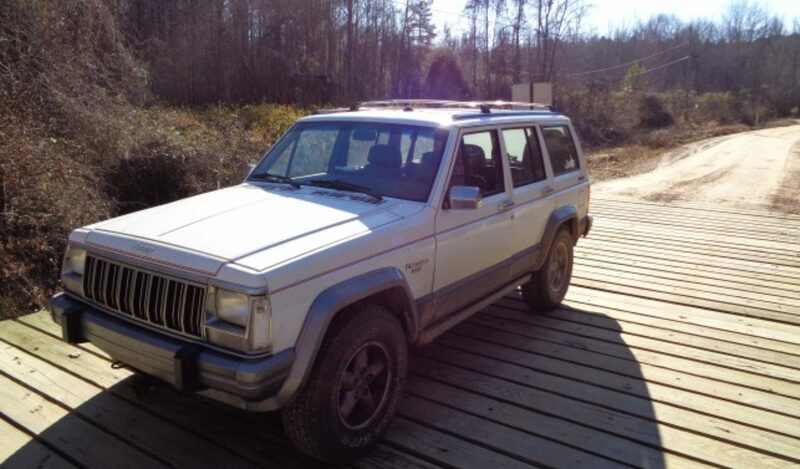 After seeing Lion’s Den for the first time last year, Josh started modifying his XJ to be ready for the challenge. On May 20, 2010 he got his chance. My trip began early that morning heading north on I 75. The trip was going uneventful until just before the Lafollette exit. I began to feel a vibration I suspected was from the trailer. At first it was only at high speed but as I drive through Lafollette, it got worse. I pulled into the Wal-Mart parking lot to check it out. I quickly noticed that there was a large chunk of rubber missing from one of the tires. This was the tire I had chosen to as a spare from an earlier tire failure. I quickly jacked up the trailer and swapped on the spare only to find it was a little low on air. I pulled out the battery compressor that my parents gave me for Christmas and aired it up. 30 minutes later I was back o the road to Harlan. I stopped at the Campground office to pay for camping and get a permit and a new map. Then I headed up the steep rugged road to the campground. This road has always been a challenge, but the recent heavy rains had it rutted out more than before. I put the Suburban in 4 low and pressed on. I could here my ramps bouncing, but I knew that if I lost momentum, there would be a scary trip backwards to deal with, so I just kept pressing on and up. Just as I was entering the campground, I met Neal on his way down. I was glad he noticed me and made room so I did not have to back off. As I got ready to unload, I noticed that one of my ramps had not made the trip and I hoped it was on the trial up the mountain. I don’t need ramps to unload anyway so I dropped Scuffy off and headed down to look for it. Also, I also noticed that the map I just bought was not in the handful of stuff I left the office with. I drove slowly down the road looking for my ramp and I was beginning to get worried when I saw it poking out the back of Evan’s Jeep. Thankfully Kevin had noticed it and picked it up on his way down to get a permit. I got my map and we all headed back up to camp. Evan helped me set up my tent while we waited for Scott P to arrive. With the gang there for the day we headed out to the trails. Knowing that rain was predicted for later in the weekend, I suggested that we head straight to Lion’s Den. There was no argument so we studied the map and found the quickest way there. Trail 45 that leads from camp to the top of the mountain makes for a good warm up. It is steep, narrow, rocky, muddy and has huge drop offs along with very tight switchbacks. We then made a run along the ridge on trial 15. The infamous stair steps on trail 15 now have a by pass. Good thing too as they have really been eroded out. At the intersection of 15 and 12 some of us continued on the part of the trail that was blocked last time. Adam and I noticed trial 12 above us and a muddy climb connecting the two so he gave it a go. Adam made it up so I decided to give it a run. I was very pleasantly surprised at the traction I got from my Maxxis Buckshots and I made it up the hill easily. Once we were all up, we headed on to Lion’s Den. We did pause briefly to play on a hill climb that I think is called Grace Trail. Part of us headed over the mountain peak by the radio tower while others went around on the lower trail. We all met back up at Lion’s Den. As we were walking the trail to see just what Josh was up against, we heard the whine of Frost’s turbo on his Toyota. He was headed into the mouth of the Lion’s Den. Just getting into the entrance was a challenge due to the mud and huge rocks. As Frosty let his rig cool, Josh made his way into the entrance. But now he had to dodge a suitcase size rock that Frosty moved on his way up. The most prominent feature of Lion’s Den is a huge boulder that over hangs the trail where the vehicle has to make a four to six foot drop. The drop is less near the boulder but due to the overhang you scrape your roof. The drop is less away from the boulder but if you slip off the outside of the rock there is a long drop off the mountain into the trees. Frosty and Josh made the scary drop both relatively uneventfully. Although I am sure it was much scarier from the driver seats. And knowing that this is the point of no return adds to drama. The next obstacle in Lion’s Den is a narrow squeeze. There is a ten foot tall boulder beside a tree with only about four feet between them. Even the narrow Toyota and the XJ will not fit. To pass through you have to place a tire either on the tree or on the rock. Or maybe a bit of both. Frosty made several tries using just his wheel power but eventually he decided to pull a winch cable. We strapped him to the peak of a rock in front of him with also gave an up pulling vector to the cable. With the assistance of the winch, Frosty made it through the squeeze but not without some damage to his custom doors. Josh's chop made clearing this rock a bit easier. Josh learned form Frosty’s passage and lineup up a bit differently for the squeeze. Josh made good use of his new exo cage but still managed to hang his spare tire on an overhanging boulder. We had to remove it from the carrier for him to pass through. Just past the squeeze you have to make a hard left turn. Again there is an overhanging rock and depending on how you land after the squeeze, you may be tucked will under it. Both Frosty and Josh used their winches to assist in making the turn. Josh’s stinger proved to be a slight hindrance here but it held up well to the abuse from the rocks. The exit of Lion’s Den is a huge rock that is too tall and narrow to be driven over. Frosty and Josh tried different lines but both resorted to a winch cable to get them over when they both ended up on their cross members with all four tires in the air. There was much rejoicing as we celebrated the victory of the Lion Tamers. All the engineering and fabrication time were made worth while by the successful passage through the Lion’s Den.